Please note: Staff Training is mandatory for all new staff. Staff Training is mandatory for all new staff and is paid. Staff Training is packed full of activities to help you get to know your fellow staff members, to learn and practice the skills you will need working with kids and leading activities, and to familiarize you with our site, rules, and procedures. 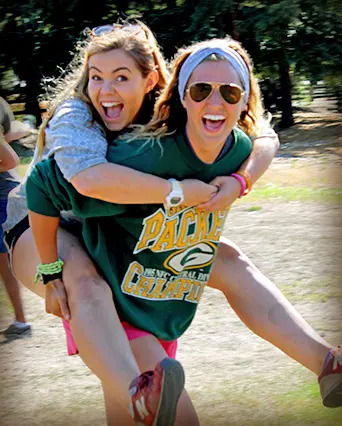 Counselors and support staff will also be asked to work for periods of time during Staff Training week in order to help prepare the facility for camp. Time off during Staff Training is limited, so we suggest you are prepared for camp when you arrive. Food and housing is provided during staff training. All resident counseling staff will live in the school dorms on campus. You will sleep on a bunk bed that has a mattress provided by camp. You will need to bring linens or a warm sleeping bag and pillow. We will take a Target/Wal-Mart trip on the first night. So, if you don’t want to pack some of those things, you will be able to purchase those when you land. Mountain Camp Woodside provides transportation to camp from San Francisco International Airport (SFO) at the beginning of Staff Training and on the morning of August 7th. Summer staff members are responsible for providing their own transportation during time off. Daily – Our day consists of four one (1) hour activity periods. Most of our summer staff will work 3 of these 4 periods and have one of these periods off. These time periods are ideal for taking advantage of our natural local workout facilities (swimming, biking, hiking, running), using the staff computer, writing letters, showering, taking a nap, etc. In addition to your period off, every week, you will have a night off from 6pm – 11pm. Weekly – Staff members receive one 22 hour period off each week. Our day off begins at Saturday at 3:30pm until Sunday at 1:30pm or Friday at 5pm until Saturday at 3pm. Staff and Campers will be provided with 3 meals a day, plus a snack. Breakfast is typically a hot option with a cereal station, yogurt, and fresh fruit. Lunch and Dinner have a hot option with a salad bar, sandwich bar, pasta bar, and fresh fruit. There is a vegetarian option at every meal; however we cannot accommodate any other dietary restrictions. You are welcome to bring your own food to camp; however it cannot be stored in the dorm rooms. The staff lounge is a large classroom with couches and a TV, designated for staff members to spend time off, watch a movie or relax away from campers. Mountain Camp Woodside has a “no electronics” culture that keeps technology out of the daily camp experience for campers and staff. It is important that staff understand and support this core value, and are comfortable separating themselves from their cell phones. Staff members may only use personal cell phones during their time off, away from campers (in the staff lounge or off site). Staff may not carry cell phones on them while on duty. Counselors are welcome to bring their own laptops and/or ipad. There will also be a computer on site that staff can access when off. Staff are able to use their own personal electronics during off time. We have fairly reliable campus wifi. Counselors will not use their electronic devices with or in front of campers. The safety of counselors personal equipment is not guaranteed or covered by Mountain Camp Woodside. Laundry can be done on site. In each dorm, their our laundry facilities. Counselors will need to provide their own detergent, but the use of the washers and dryers is free. Our staff team consists of three (3) Directors and junior leadership team of another eight (8) supervisors. This “leadership team” will be there to give you support and offer feedback through the summer. 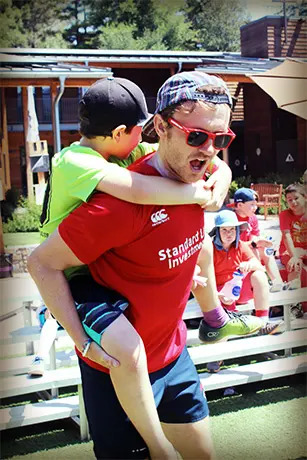 In addition, we have a few specialist roles to help out the camp outside the job of counselor. Some people assume that summer camp will be hot all the time! It can be hot, especially during the day. Some weeks can reach 100 degrees F. Please bring appropriate clothes. Camp will have sunscreen around campus. However, camp can also be cold. Nights do cool off and most counselors will wear a hoodie and/or long pants to campfire. We also will sometimes have fog come over from the sea that will make the mornings cool. We do not usually have to worry about rain during the summer. Also, during your time off, places like San Francisco can be really cool during the summer. Every night campers and counselors participate in an evening program activity. 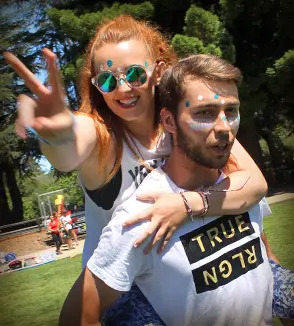 These include activities such as Campfire, Skit Nights, different versions of Capture the Flag, Harry Potter Night, Clue Night and much more. . Staff are assigned responsibilities during evening program. The Evening Program Specialist oversees this program area. The curfew for all of our summer staff is 11:00 pm (Trust us, you’ll be tired). Please be reminded that you are living in a room with 5-7 other counselors. Most of your belongings will be in your dorm room with you and Mountain Camp Woodside is not liable for any lost or stolen property. Staff are able to put small valuables (passports, plane tickets, cash, etc.) in our office lock box, and may store prescription medications with our nurse. Due to security concerns, Mountain Camp Woodside does not allow summer staff to have visitors while camp is in session. Mountain Camp Woodside has equipment available to staff for personal use during time off. Campers always have first priority with all camp equipment and staff are expected to return camp equipment in good working condition, or report any damages to a director. Staff is responsible for any damage to equipment while in their possession. Smoking is not permitted on the campus Woodside Priory School. The use of any controlled substances is absolutely prohibited while you are a staff member at Mountain Camp Woodside. Absolutely NO alcoholic beverages may be brought onto camp property and no one is to return to camp under the influence. We fully screen all applicants before hire and during Staff Training with thorough background and reference checks and fingerprinting. This includes county, state, and national databases. Although we can issue standard checks (cheques) for payment, we recommend that all domestic staff (or international staff who have American bank accounts) enroll for direct deposit. Both international and domestic staff can also choose to receive their salary on a Pay Card which operates as a debit card. Information about setting up direct deposit or pay cards will be provided after hiring, but before the start of camp.